Hummingbird is about semantics and in order to make your web pages rank high on the search results, you have to make them semantically richer. In this post, I will discuss about 5 tools that will help to uncover the complexities behind semantics and allows you to make your website’s content semantically richer and user friendly. Get ready to market your site and serve your users well. But before that, let’s have a little overview on semantic search and the Hummingbird update. Semantics is an area of linguistic study which deals with meanings. Semantics allows you to understand the meaning behind symbols used in languages. It enables you to detect identities and the relationships between them. Google has been using semantics since a long period of time but because semantics deals with a large amount of data complication so it took Google many years to produce desired results. Google launched the Hummingbird Update in the last week of August in the year 2013. This update was huge and affected around 90% of the search queries but interestingly SEO’s and webmasters never saw a huge decrease or increase in traffic and no one noticed this update until Google announced about the update a few weeks later of its launch. The reason was it wasn’t a search spam update which declined the ranking of the site. Instead, it was a core search algorithm change which changed the manner in which Google predicted the user search queries. Firstly, Google build up a large database of identities and their relationships which they call as the “Knowledge Graph”. Then, it started to use that in order to find out the semantic relationship between the words present in the user query. However, there are several other queries for which Google still relies on high confidence resources in order to predict and identify answers to the user query. These resources can be any website which Google trusts. For locally relevant queries or informational queries, web pages ranking high have two basic reasons of ranking higher. First is their high confidence scores with Google and second is that they are semantically more relevant than the other web pages. Building high reputational scores is completely based on the number and quality of backlinks your web pages receive and making the site content semantically more relevant depends on the pattern of words used in the site. 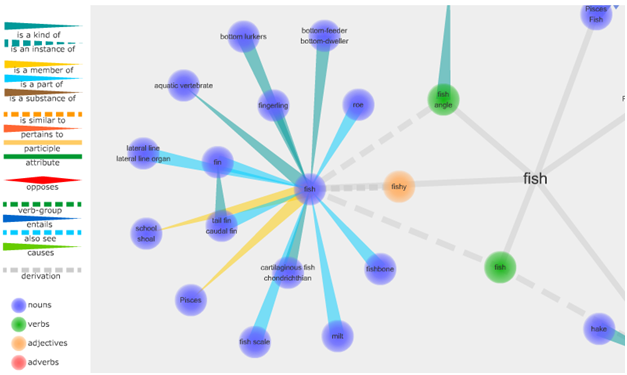 Sensebot is a semantic search engine which predicts the user intent behind the search query and displays results which fulfills the user’s intent. Interestingly, a similar pattern is followed by Google. What is good with Sensebot is that it also displays a set of words that are semantically relevant to the user’s original search query. This means that Sensebot will give us an idea about the words which we should use in our web pages in order to rank for that search query (please note, this is not the only factor that Google uses but there are several other factors for ranking). Clearly enough these words are all interrelated to each other and any web page that uses these words (or topics) in it will become more relevant for the search query “film making”. In normal sentence structuring, we often use these words while writing any article on the topic of film making but in order to make things even more easier, Sensebot can help us in revealing the user intent behind the search as any user typing the search query “film making” would be interested in knowing about Hollywood, movie, filmmakers, producers etc so inclusion of these topics becomes necessary in order to fulfill the searchers intent. Google does a great job of restructuring the user query by replacing queries with synonyms even though the user has not entered those words in the search query box. Having proper synonyms on your web page will double your chances for ranking well. Synonym-finder is an awesome tool for finding synonyms for any word. As for example, for the word “ make”, the synonym-finder displays a lot of results like “create”, “build”, “prepare” etc. For a query like “how to make a boat”, Google returns search results containing the word “build” in them even thought the user has not specifically included it in the search query. Another useful tool in finding semantically related words for a broader meaning search query is semantic link. 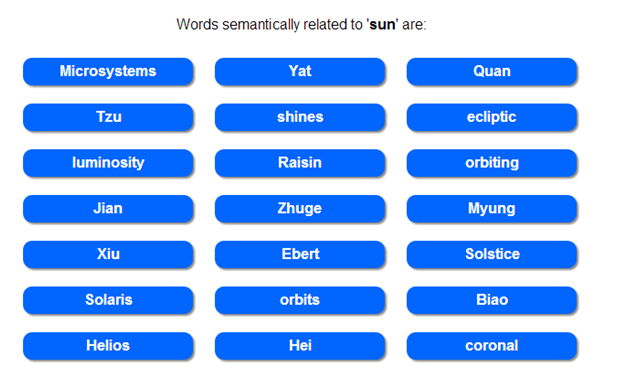 This tool helps you to reveal all the words that are related to each other not just by chance but because they have a relationship between them. Another visually stunning tool which quickly gathers information like nouns, verbs, adverbs, adjectives, verb group, attribute, participle of any word is Visuwords. This tool is certainly helpful to make web pages more relevant for broader meaning in depth queries. LSI keywords lets you analyze the one word, two word and three words phrases that are present on the web pages ranking in top 5 of Google search results with respect to the entered search query. This is immensely helpful in locating terms which might be useful from search engines relevancy algorithm point of view and which you might have missed to include in the search results. The image below displays LSI Keyword data for the query “seo”. The tool gathers one word, two word and three word data from the top 5 Google listings ranking for the keyword “seo” in Google search results. Please make sure to use the above tools as a resource for better serving your users and not as tools to manipulate Google search results. Always remember, Google has an expert team of genius minds working for them and any sort of spam will be easily spotted by Google making your site suffer in search rankings. Use the above guide as a help to create web pages that helps to answer the user queries in the best possible way without the sole purpose of ranking well in the search engines. Do not forget about the engagement metrics which Google considers before ranking any web page in the search results. Just making your web pages semantically more relevant would not serve the purpose as long as the pages are not getting any attention from the real users in terms of backlinks and social media engagement.